MURDOCH, GEORGE, businessman and politician; b. 29 April 1850 in Paisley, Scotland; father of at least three sons and two daughters; d. 2 Feb. 1910 in Calgary. At the age of four George Murdoch accompanied his family to Saint John, N.B., where he spent his boyhood. He learned the harness business in Chicago, but moved back to New Brunswick after he was burned out in the great fire of 1871. He was probably the George Murdoch who married Maggie Flood on 1 Jan. 1879 in Saint John. Certainly his wife was named Margaret, and they had two children while still in the province. Murdoch came to Calgary from Saint John in the spring of 1883, when the settlement was a cluster of assorted tent residences on both banks of the Elbow River. The pending arrival of the railroad, in August 1883, and the Canadian Pacific Railway Company’s expected designation of a town-site there had created a mood of restless anticipation. Opportunities for a harness maker were good, and he “charged like mischief” in these days, he admitted. He advertised, “harness and saddles. All kinds Manufactured on the Premises by Skilled Workmen. Miners’ & Ranchers’ Outfits a Specialty.” Among his customers were the North-West Mounted Police and the Blackfoot. 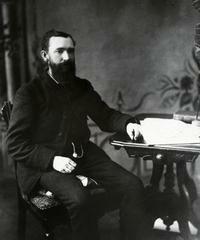 As one of the first permanent businessmen in the community, Murdoch became an important force in the movement to secure incorporation for Calgary from the government of the North-West Territories. The bid’s success in November 1884 made Calgary the second town in the territories. Murdoch demonstrated his good standing there by taking the mayoralty in a clear victory during the inaugural municipal elections held the next month. In the winter of 1885–86 Murdoch was a central figure in a controversy over the enforcement of a section of the North-West Territories Act that virtually precluded the legal consumption of alcohol. Designed primarily to protect the native people, the law in effect restricted the procurement of alcohol to that which could be obtained for medicinal purposes under a permit issued by the lieutenant governor. Subject to frequent and often flagrant abuse, the law was widely detested and was inconsistently enforced by the local constabulary and the NWMP. As a justice of the peace, Murdoch treated violators leniently, noting in his diary that to do otherwise would be suicidal. The practice earned him the strong disapproval of Jeremiah Travis*, the federally appointed stipendiary magistrate who was bent on enforcing the law to the letter. When resentment of the law culminated in overt opposition in November 1885, Murdoch emerged as a strong civic spokesman and popular martyr. He publicly defended Simon John Clarke, a town councillor and saloon owner whom Travis had jailed, and he journeyed to Ottawa on behalf of the town to protest Travis’s action. Then in early 1886, despite having been overwhelmingly re-elected as mayor, Murdoch was removed from office by Travis, as was his entire council. Although the charge that he had tampered with the voters’ lists was unsubstantiated, Murdoch none the less was fined $200. Travis ordered an auction of his personal possessions to pay the sum, but no one would bid. The officers installed to replace the ousted council were unable to govern owing to lack of public support. The result was the virtual absence of municipal government in Calgary for 1886. Murdoch did receive some vindication in that Travis was suspended in March of that year and later superannuated. There also can be little doubt that the incidents, by focusing attention on an unfair law, helped hasten its repeal in 1891. Although politically active over the next decade, Murdoch was never again a serious force in municipal affairs. A new élite was emerging, businessmen who wanted a more responsible civic government and who found Murdoch’s earthiness and easy-going attitudes inappropriate. He was, nevertheless, a member of the council of 1889 which was elected at a public meeting to bring proper management to civic affairs. He also served an aldermanic term in 1895 and was an unsuccessful candidate for the mayoralty in 1890. Murdoch made other contributions to Calgary’s early urban life. One of the founders of the Presbyterian church and the St Andrew’s Society, he was also a pioneer member of several masonic lodges, and was active in the literary and history societies, the turf club, the agricultural association, and the volunteer fire brigade. He was on particularly good terms with the native people, especially the Blackfoot whose language he spoke. His home on Seventh Avenue and later on Nose Creek north of the Bow River was a favourite visiting place for Indians, who called him Leather Man. Yet perhaps Murdoch’s most enduring legacy lies in the diary and notes he kept assiduously during his early years in the west. With their insight and detail his comments provide a valuable account of frontier life as seen through the eyes of a newcomer and permanent resident. In a general sense George Murdoch epitomized the hard-working, community-conscious businessmen whose commercial, political, and social activities helped lay the foundations of urban development throughout western Canada in the late 19th and early 20th centuries. Collectively and anonymously they provided the initiative and energy which helped transform village into town, and town into city. In his imposed role as a spokesman protesting an unpopular law, and through his recorded commentary on life in his new environment, Murdoch is allowed a historical place denied to many of his contemporaries. NA, MG 29, C13 (transcripts; mfm. at GA). Calgary Herald, 1885–1910. Daily Sun (Saint John, N.B. ), 2 Jan. 1879. Calgary, Alberta, Canada: her industries and resources, comp. [T. S.] Burns and [G. B.] Elliott (Calgary, 1885; repr. 1974). Max Foran, “Early Calgary, 1875–1895: the controversies surrounding the townsite location and the direction of town expansion,” Cities in the west . . . , ed. A. R. McCormack and Ian McPherson (National Museum of Man, Mercury ser., Hist. Div. paper no.10, Ottawa, 1975), 26–45; “The ‘Travis affair,’” Alberta Hist. Rev. (Calgary), 19 (1971), no.4: 1–7. Max Foran with Edward Cavell, Calgary: an illustrated history (Toronto 1978). Max Foran, “MURDOCH, GEORGE,” in Dictionary of Canadian Biography, vol. 13, University of Toronto/Université Laval, 2003–, accessed April 26, 2019, http://www.biographi.ca/en/bio/murdoch_george_13E.html.